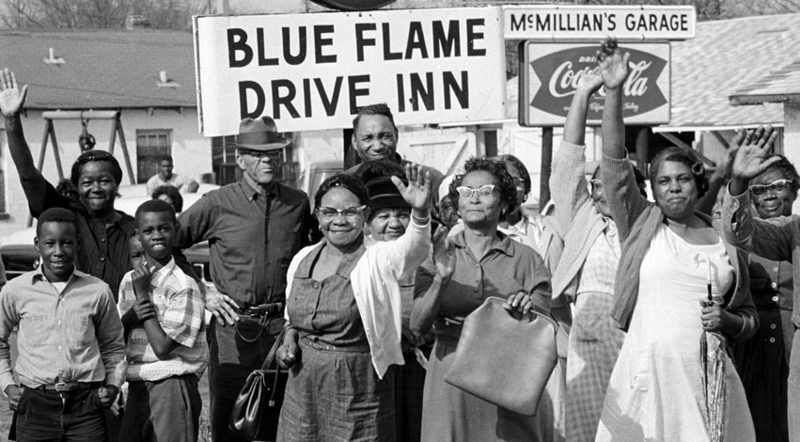 All the way from Selma town. 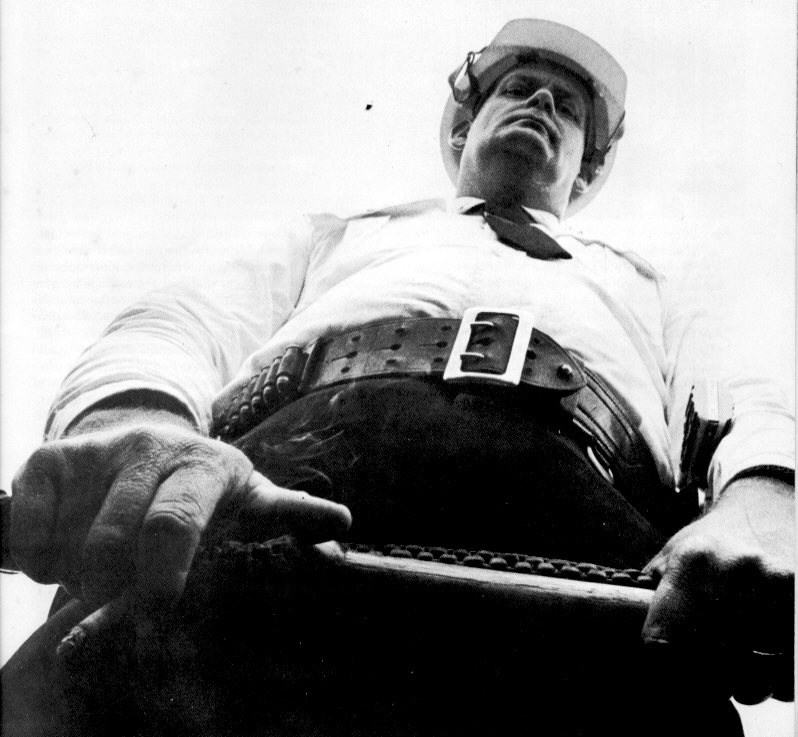 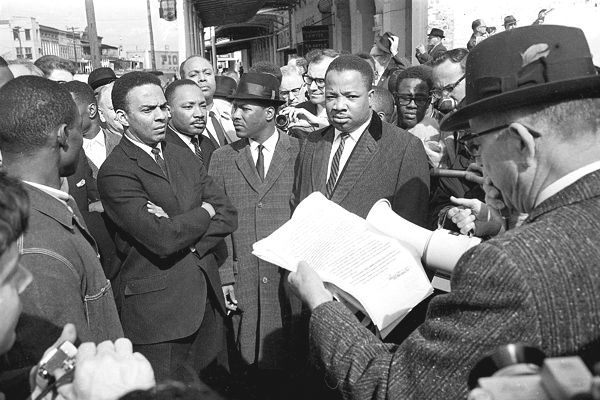 A federal marshal delivers injunction forbidding the march. 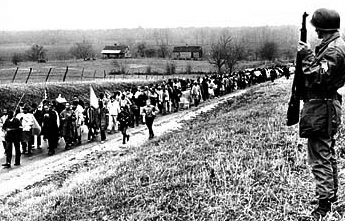 The 2nd attempt to march to Montgomery is forced to turn around on Tuesday, March 9th. 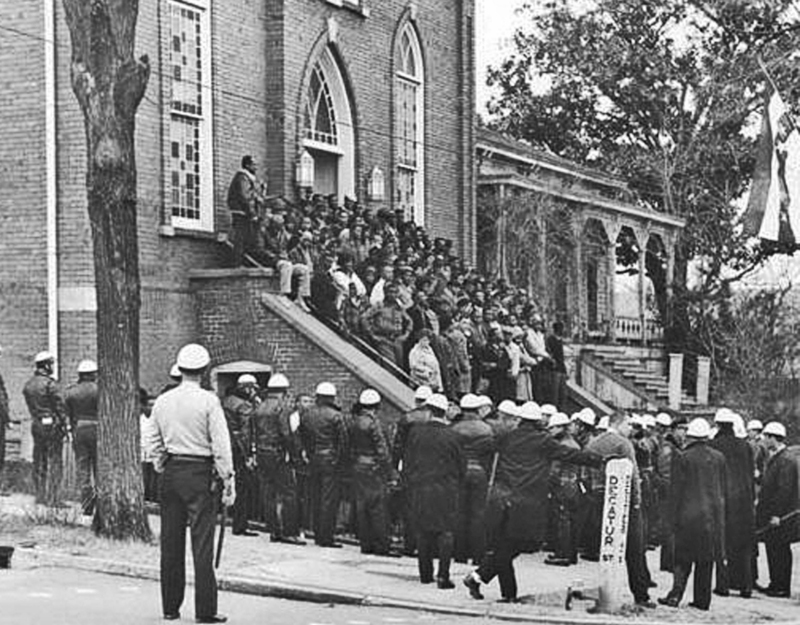 To prevent any further marching, the police stretch a rope across Sylvan Street outside of Brown Chapel. 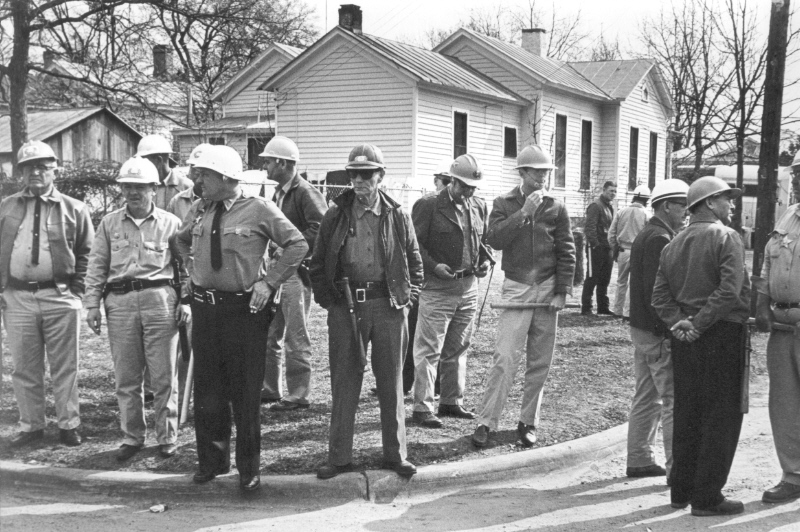 It is guarded by a line of cops. 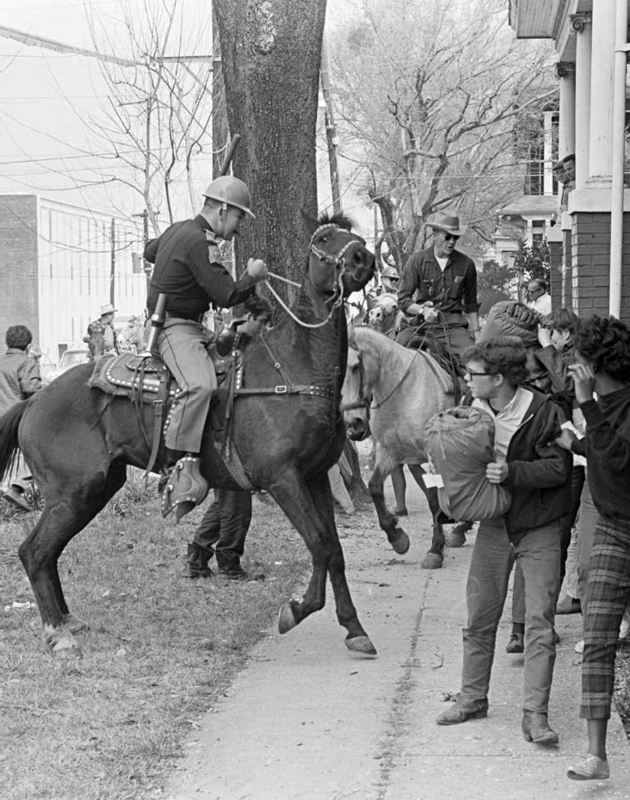 Anyone marching past the rope faces arrest, a beating, or worse. 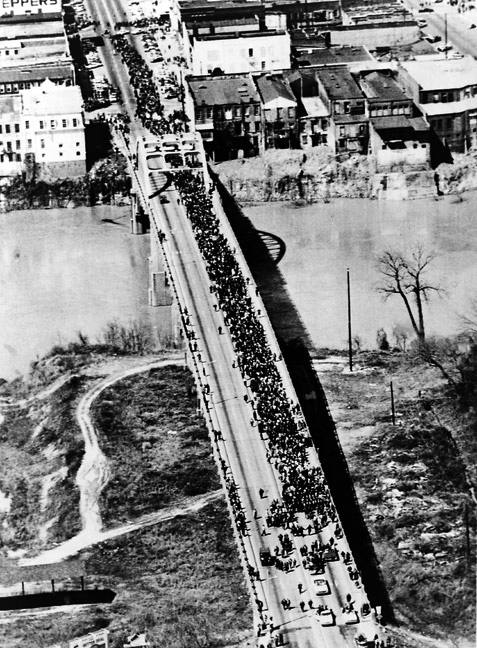 Around the clock  24/7  day after day, night after night, in freezing rain and blazing sun, the marchers press against the rope they call the "Berlin Wall." 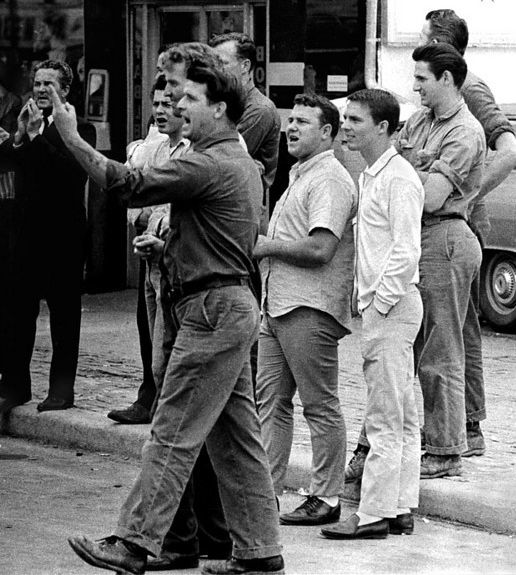 Holding the line at the "Berlin Wall." 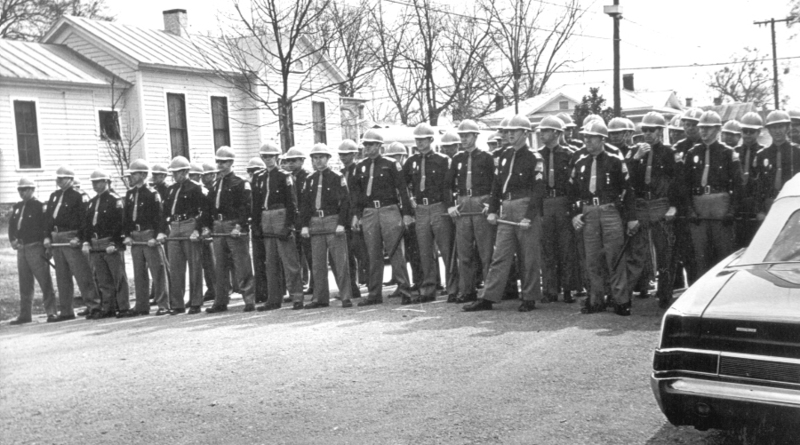 Sheriffs deputies and possemen ready to contain any breakout attempt. 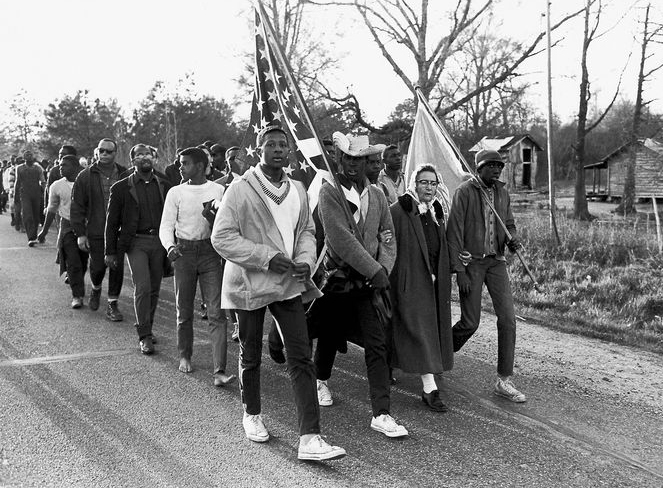 Black students from Tuskegee and Alabama State march on the capitol in Montgomery to demand voting rights. 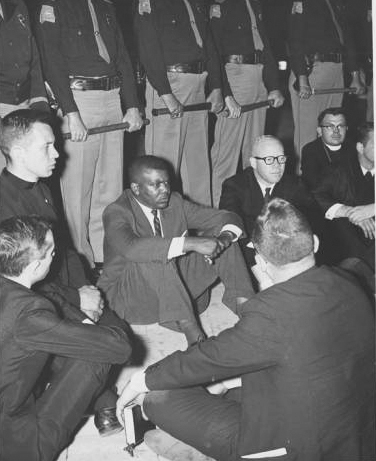 Blocked and surrounded by cops in front of the capitol. 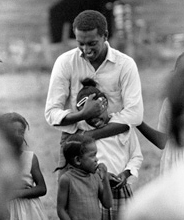 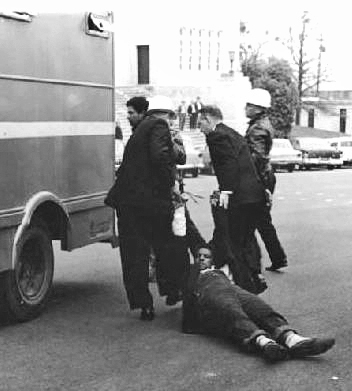 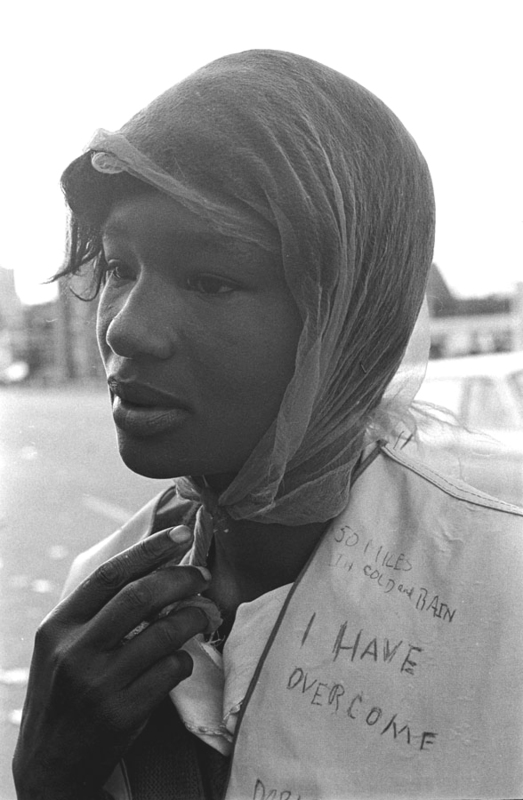 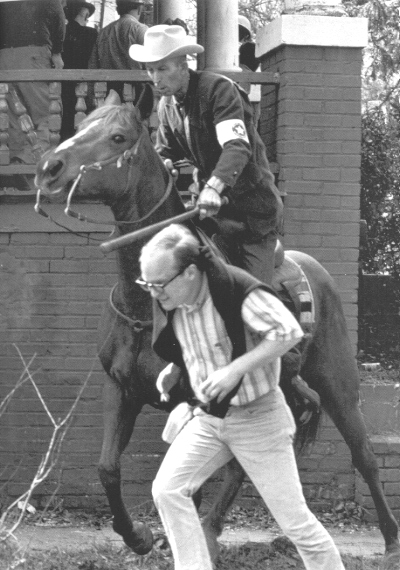 SNCC leader Jim Forman is arrested and dragged away. 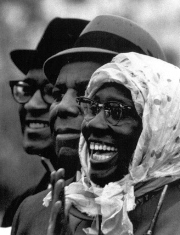 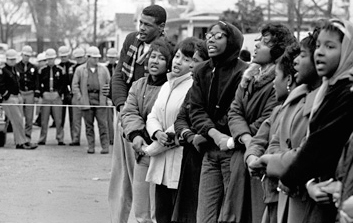 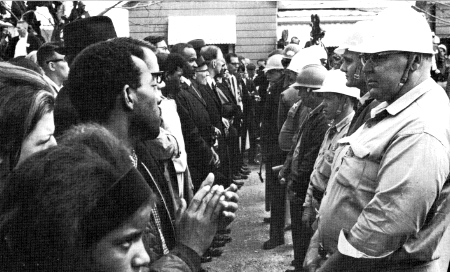 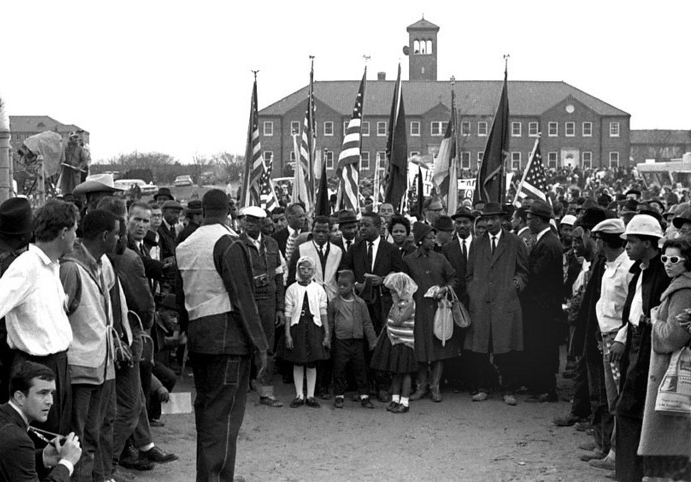 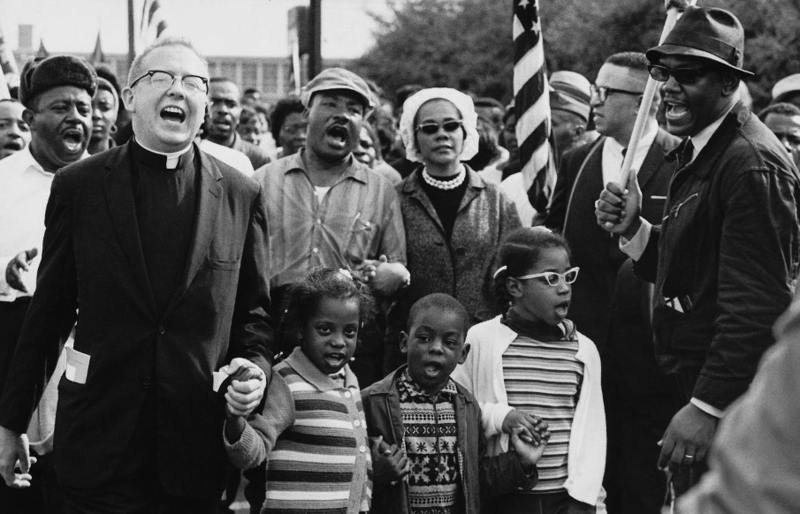 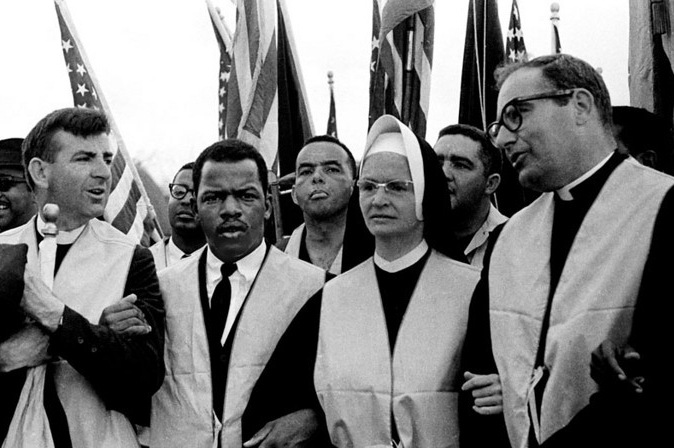 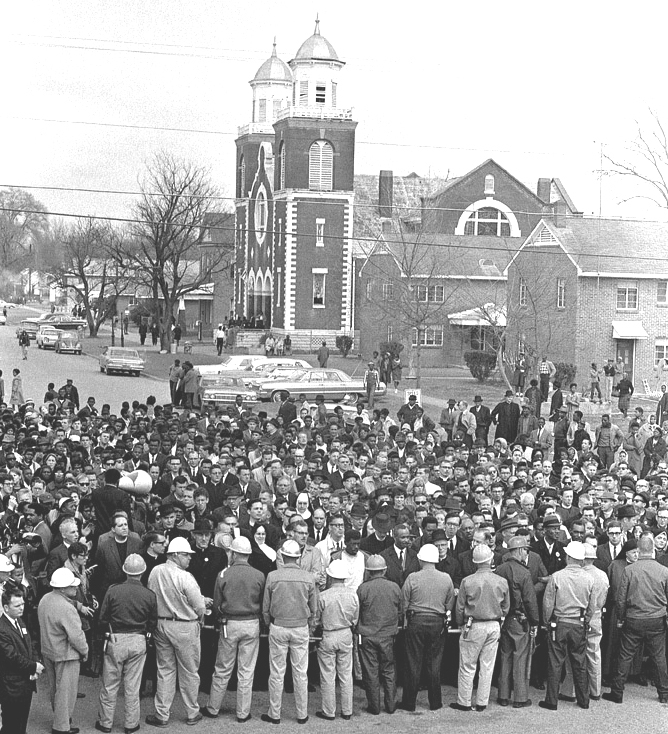 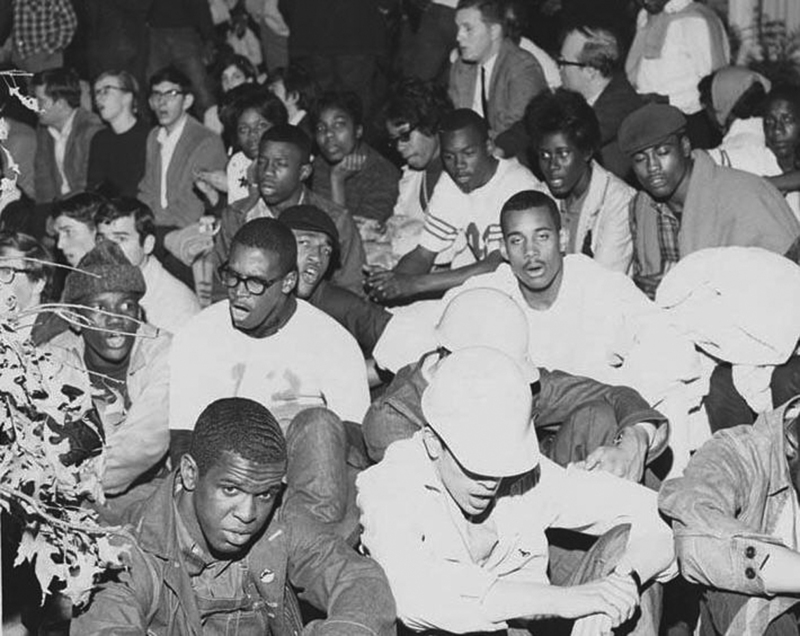 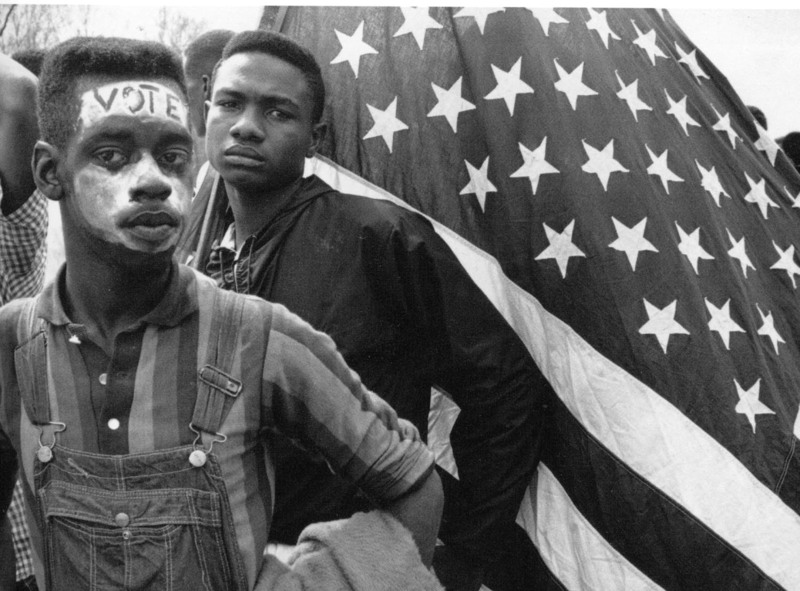 To support the embattled citizens of Selma, James Forman of SNCC calls on students from around the country to join those from Tuskegee Institute and Alabama State College in a mass student march in Montgomery. 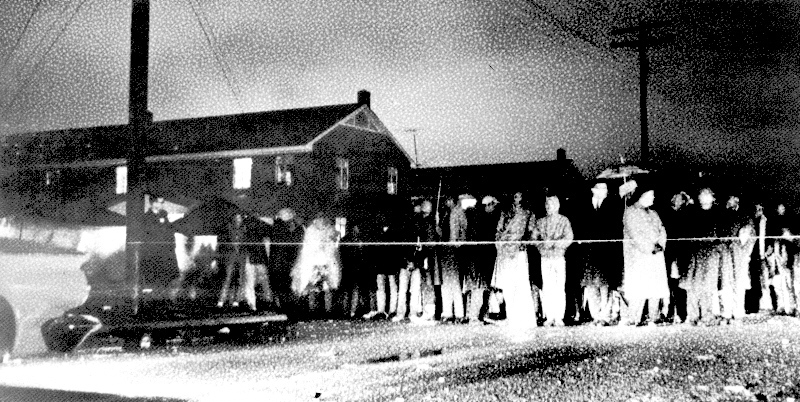 They are clubbed and arrested by posse, trooper, and cop. 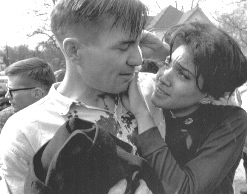 Juniata College student leader Harriet Richardson and "poet-in- residence" Galway Kinnell after being beaten on the student march. 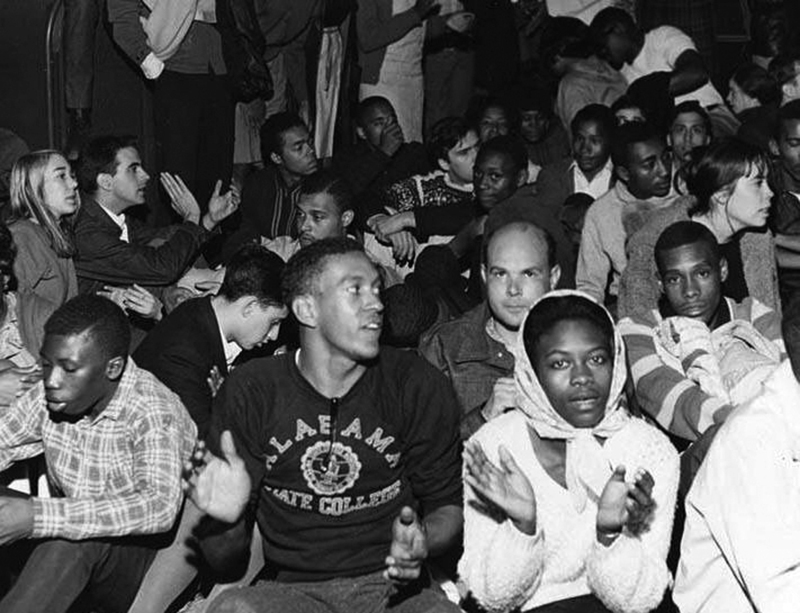 College officials had opposed their participation and ordered them to remain at school. 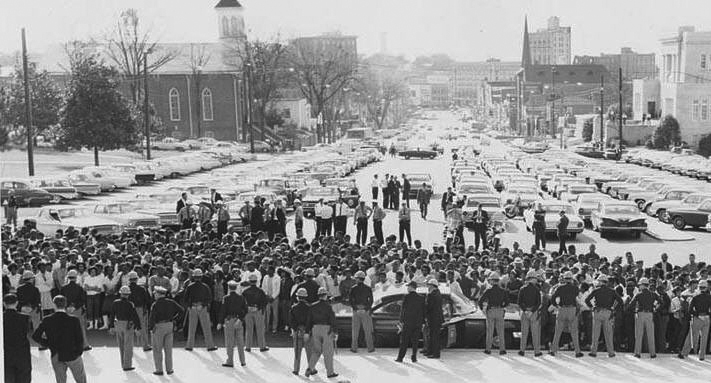 Mass march against police oppression to the Montgomery Sheriff's Department. 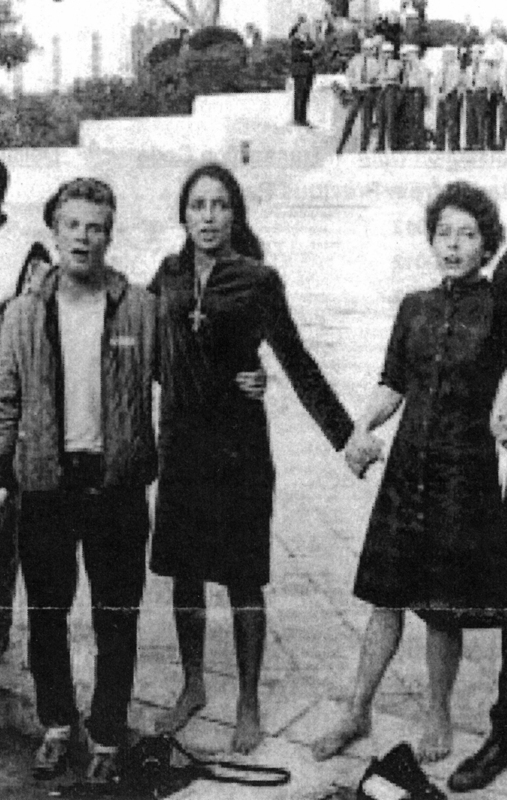 Arkansas (Strider) Benston, Joan Baez, and Mimi Farina protesting in front of Alabama Capitol steps. 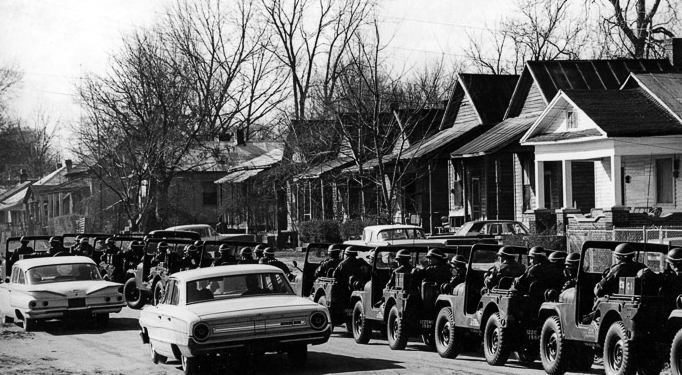 Soldiers in jeeps ready for the march to commence. 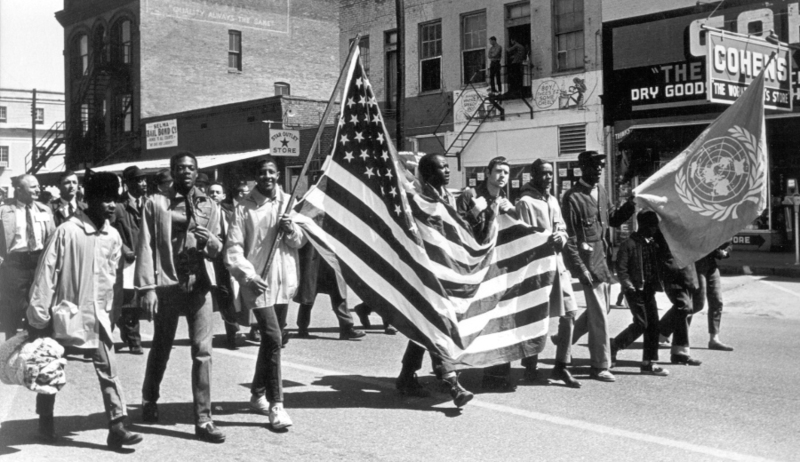 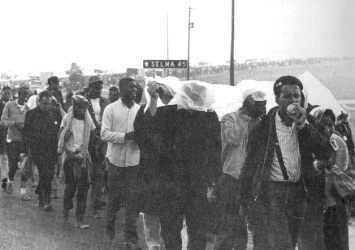 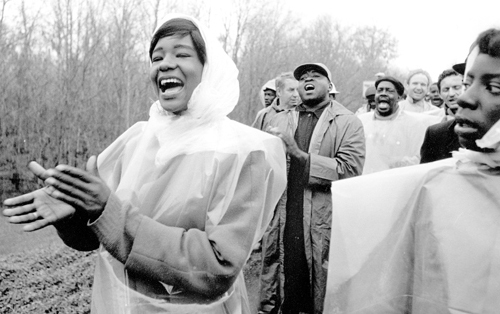 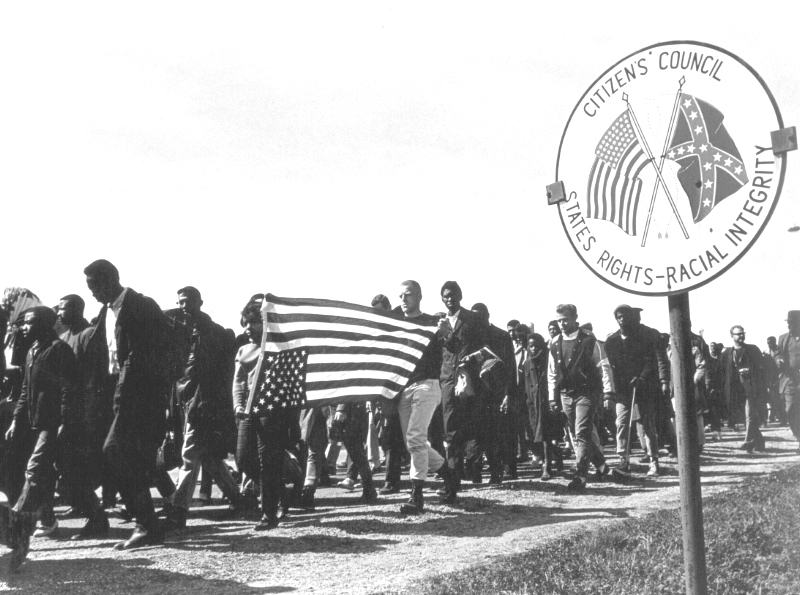 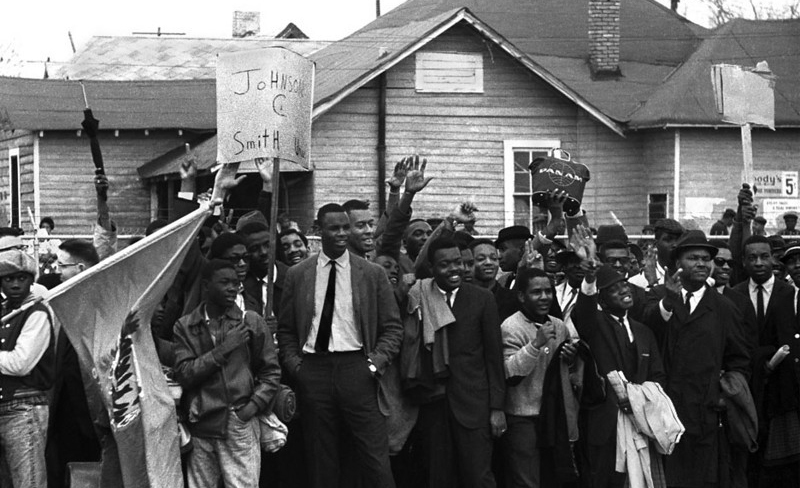 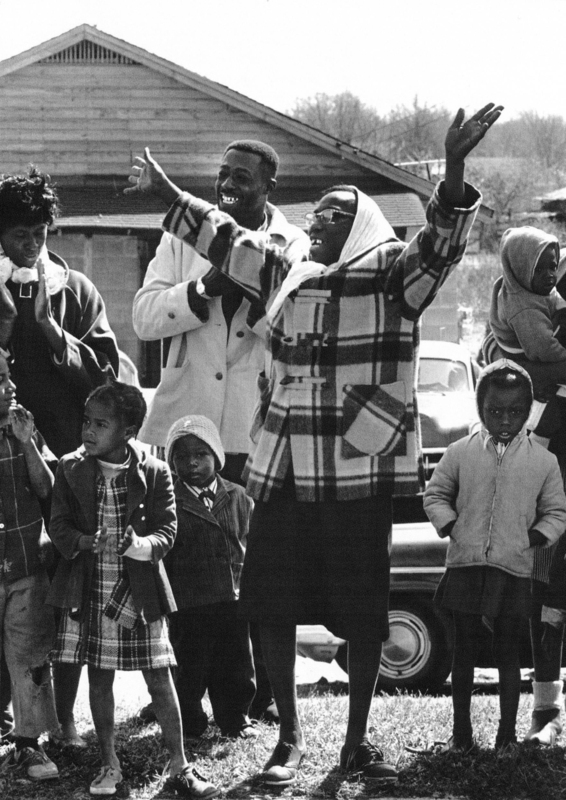 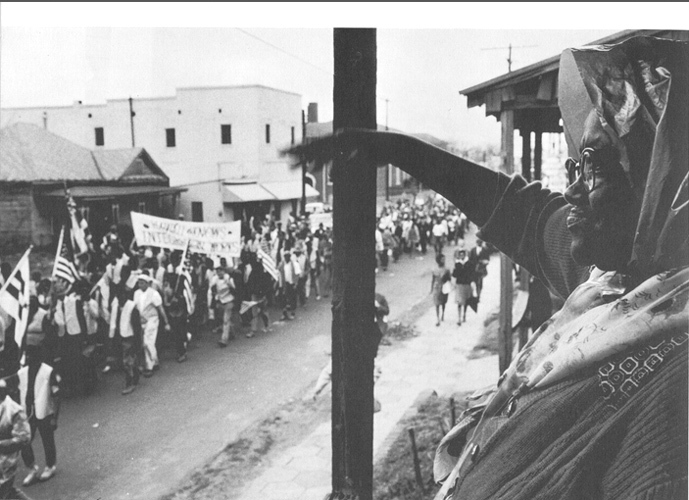 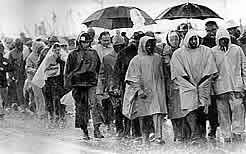 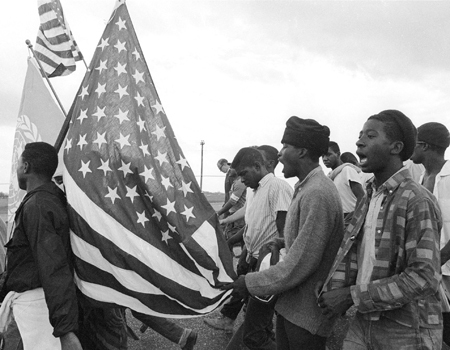 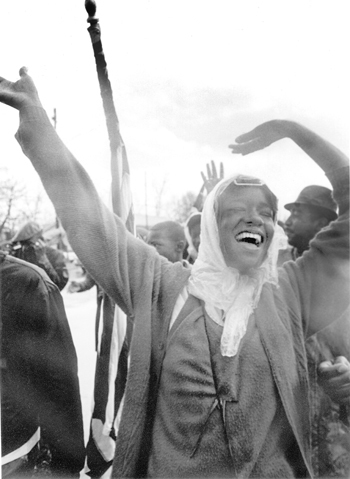 Marching out of Selma on the road to Montgomery. 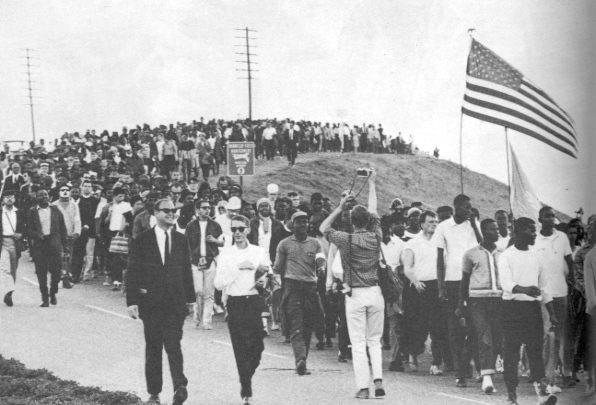 Thousands strong, the march crosses over the Edmund Pettus Bridge. 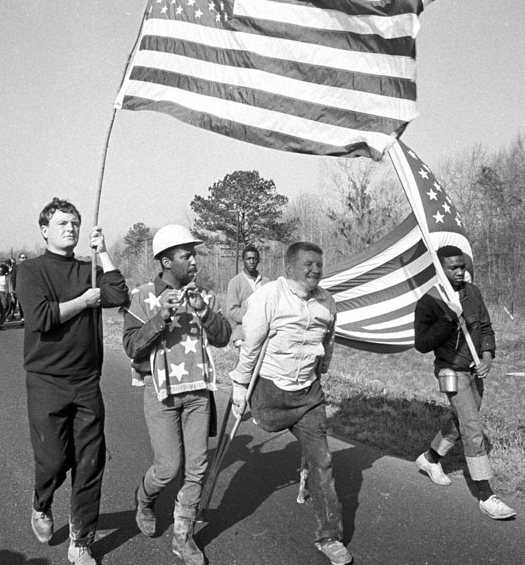 The March crosses Lowndes County, a stronghold of the Ku Klux Klan. 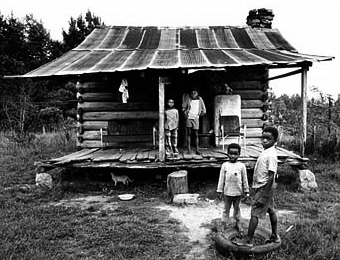 Population: 81% Black, 19% white. 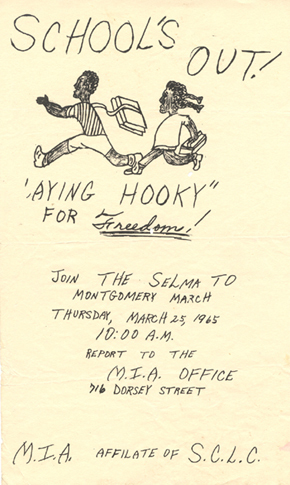 Lowndes County, Hiway-80 from Selma to Montgomery. 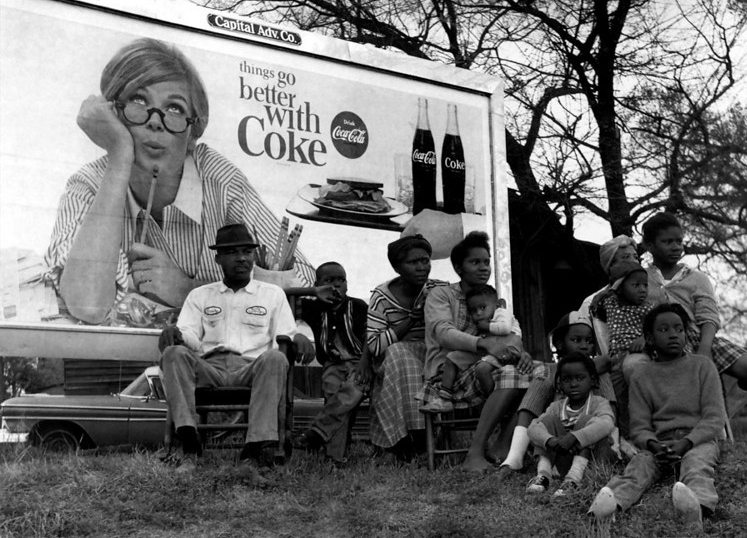 65 year old Nannie Washburn of Georgia is third from left. 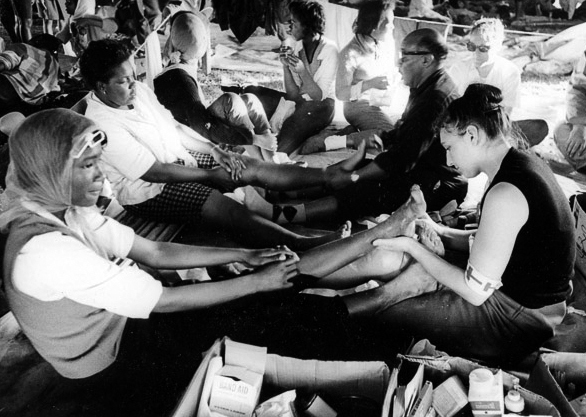 Dr. June Finer attends to the blistered feet of Wilcox County marcher Doris Wilson while other doctors & nurses of the Medical Committee for Human Rights (MCHR) provide first aid to others. 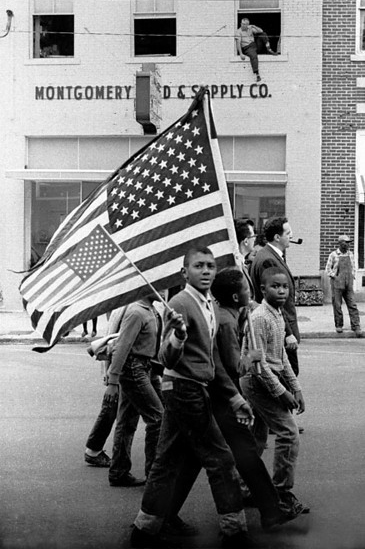 Watching the March pass by. 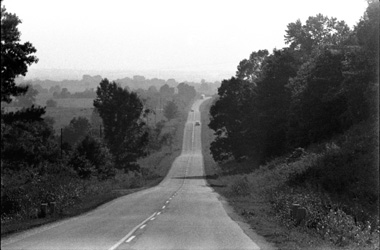 On the Jefferson Davis highway (US-80), approaching Montgomery. 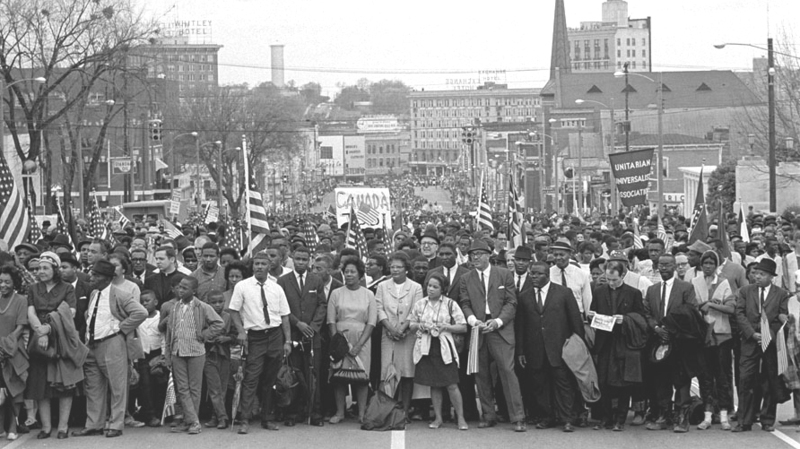 Marching to the State Capitol, Montgomery, Alabama. 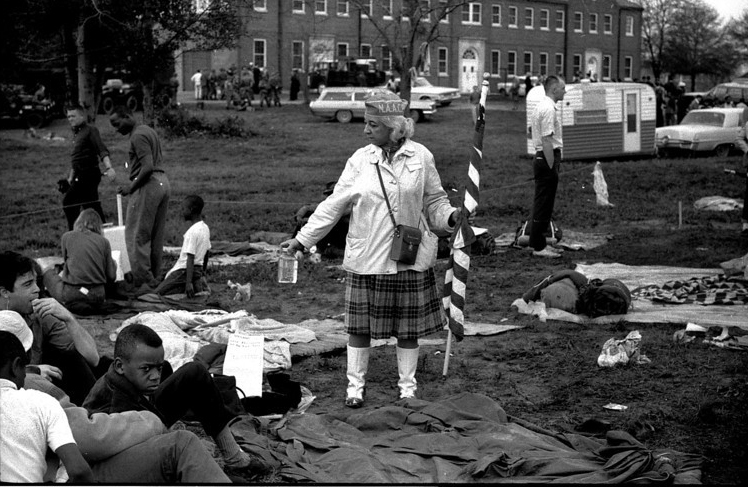 Break of Dawn at the Last Campsite, City of St. Jude School, Montgomery, Alabama. 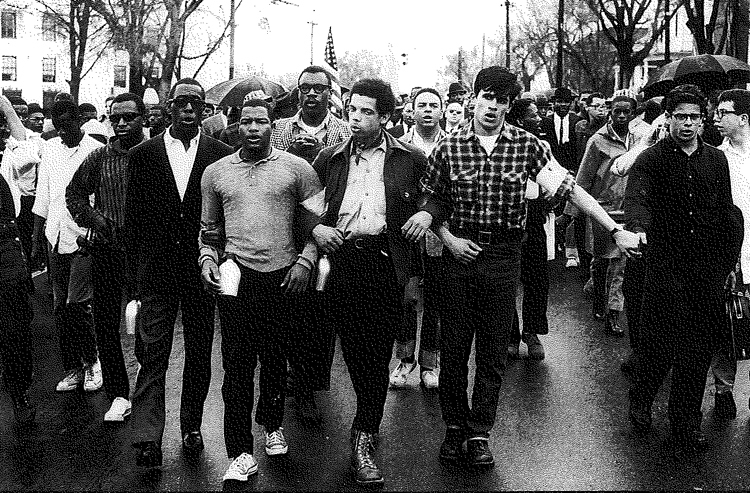 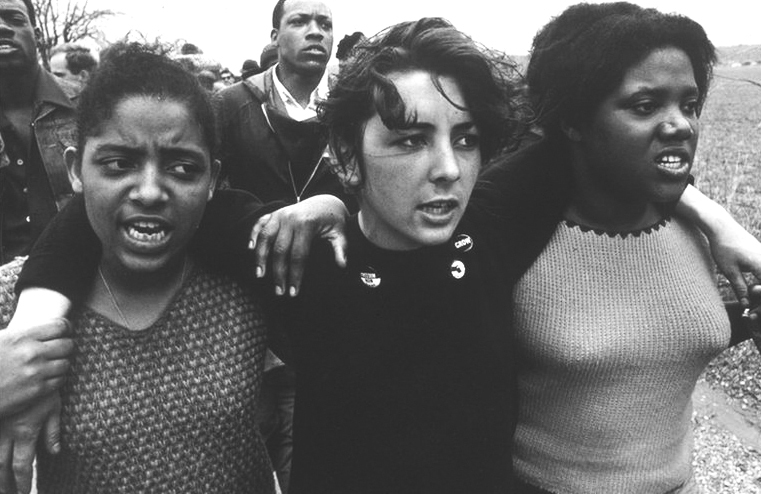 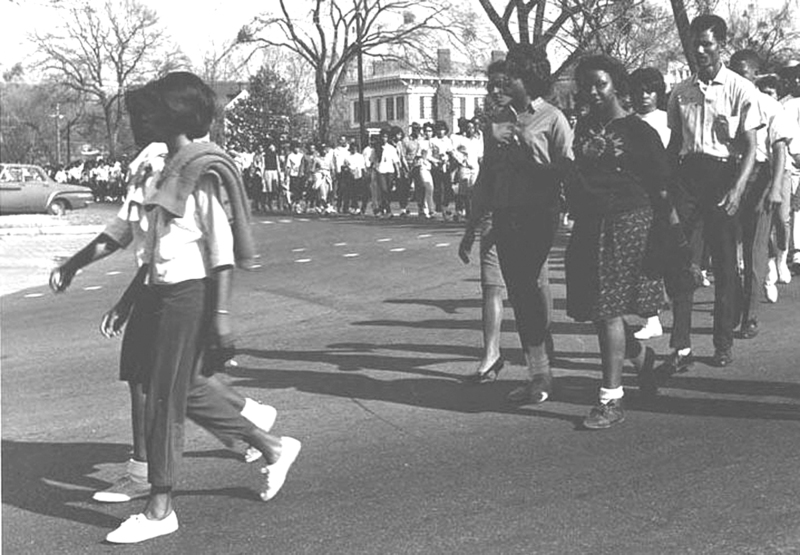 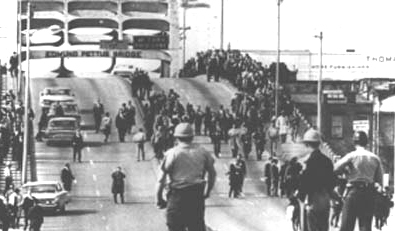 The March Forms Up for the Final Push to the Alabama State Capitol, March 25, 1965. 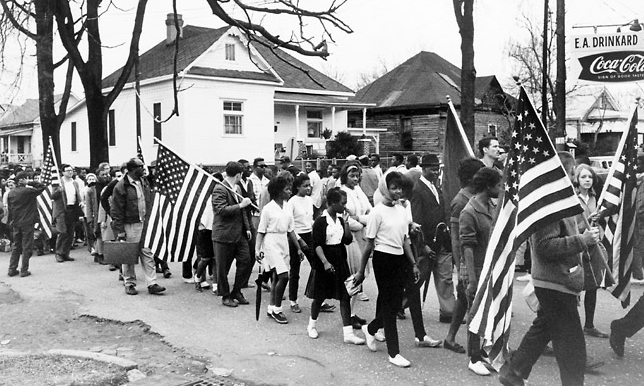 High school students flood out of class to welcome and then join the marchers. 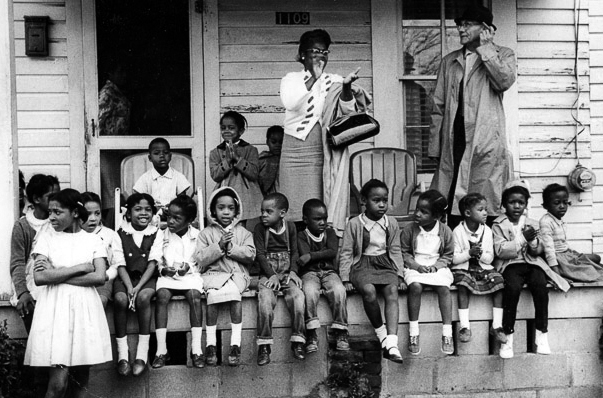 Children from a day care center near watch the passing marchers. 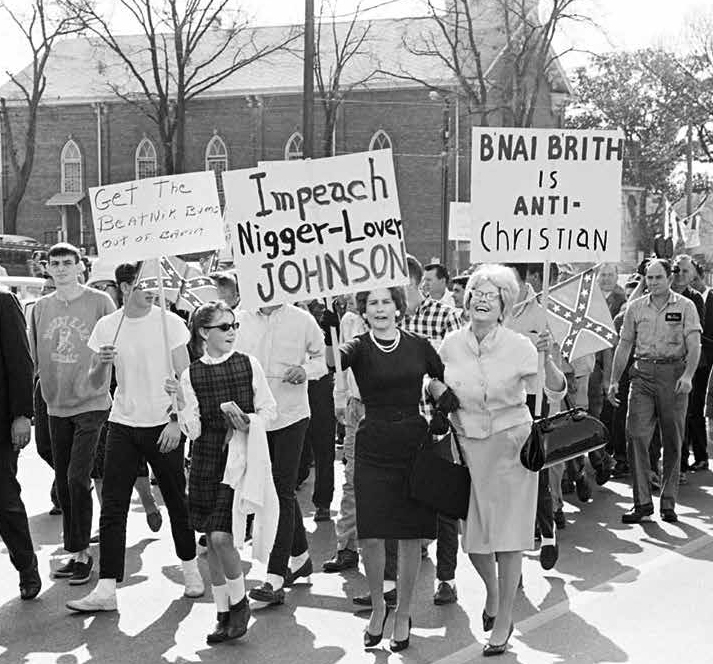 The marchers are not universally welcomed by all. 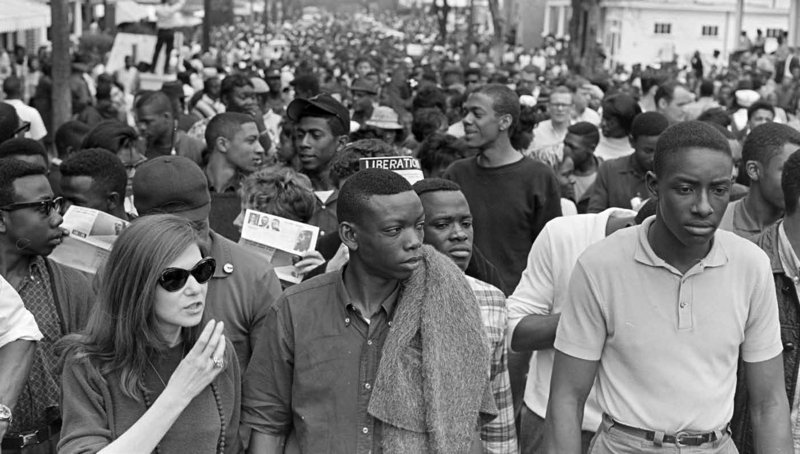 25,000 strong, the March advances towards the Capitol building in Montgomery.